The Cute Potato family spent last Friday at Fenway Park with the Biddeford Tigers. The kids and their parents took part in a CVS Caremark All Kids Can Baseball Camp, which is designed for children with physical and/or developmental disabilities. Now in its 7th year, the baseball camp initiative — a team effort between CVS Caremark and the Boston Red Sox — is part of CVS Caremark’s national philanthropic “All Kids Can” program, which focuses on helping children with disabilities learn, play and succeed in life. The day was particularly exciting for Maine: Biddeford is the first Little League Challenger team from the state to participate in the event. Our day began with a visit to the batting tunnel and lessons from Red Sox hitting coach, Dave Magadan. Coach Dave was great with all the kids, taking time to help them with their stance and ensuring each was able to make contact with the ball. MP never saw so many big smiles in one room. CP#1 was game to learn from Coach Dave, while CP#2 preferred to hang out in the dugout with his Dad, sipping his first Coca-Cola. After hitting practice, we walked on the field to find the Biddeford team’s name displayed on the scoreboard. MP isn’t sure who was more excited: the kids or the adults. The kids even had a chance to bat at home plate with Coach Dave. The heat was record-breaking, but no one seemed to mind. The highlight of the day for CP#2, and for several kids on the team, was Wally’s lunchtime visit. The loveable mascot signed autographs for all of the campers and had hugs for everyone. For MP and DP, batting practice was a thrill. It was a treat to see CP#1 and #2’s favorite players: Dustin Pedroia, Big Papi and Adrian Gonzalez (who kindly signed the kids’ baseballs). Dance music blared while the players hit ball after ball over the Green Monster. We were all pinching ourselves, feeling fortunate to be a part of such an amazing day. This year marks the inaugural season for the Biddeford Tigers, and our family was thrilled to share this incredible experience with them. 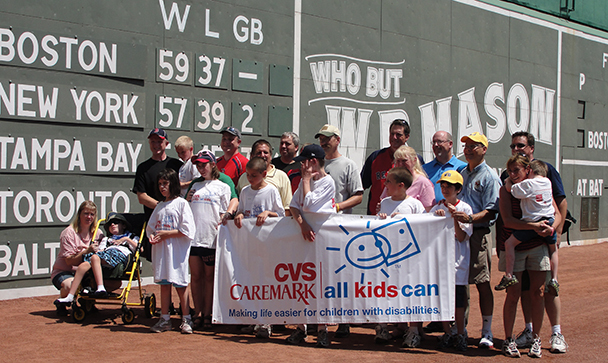 Special thanks to the kind staff at Fenway and the team at CVS Caremark for making the camps possible! To learn more about Challenger teams and how you can create one in your town, visit here.